What features might trigger millennials to place a router on a key location in their home? Usually, that’s the space where they spent most of their time and where memories are created, together with family, friends and relatives. Our challenge? Find out why and when they would do so! We believe that living in a small appartement, no more than one device is needed. Since Lilly loves the design of her 'internet box' she doesn't mind displaying it on her dresser. Lilly is a 26 year old young woman who lives and works in the city. She lives in a small apartment with her little dog Kaiser. She is very dependent on her two best friends. She's a fashionable art lover and loves to party. On quiet evenings she invites her friends for a cozy diner and a movie. The 'Big Idea' for Lilly's concept is based on a display that consists of multiple LED's that act as 'pixels'. Interaction with the device happens through a single button at the centre of the device. The design of the device is curved and shows small color accents to stress a vivid playfulness. The LED display is hidden behind a diffused recycled transparent plastic cover, surprising Lilly while interacting with the device. 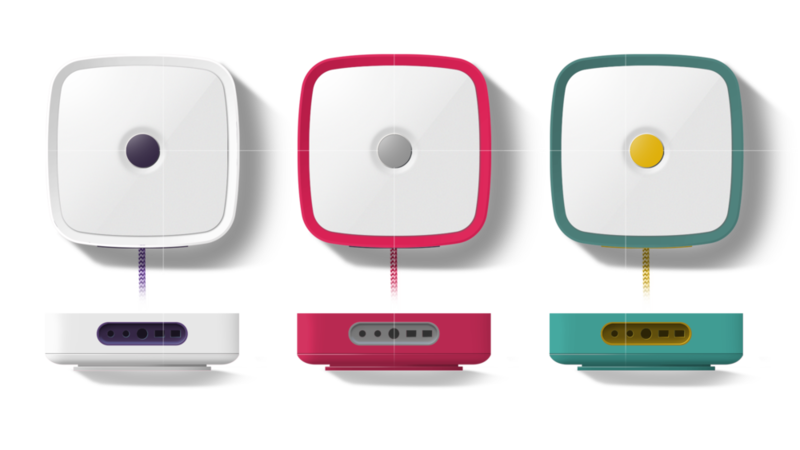 The unique, yet simple shape and unicoloured body makes the device unobtrusive and lets it stand out from competitor devices. We choose to use ABS plastic without color additives which makes it easier to recycle. The product is design for de-assembly, no glue is used. The device is accompanied with a clever wall mount / display stand. To hang the device, just screw the mount to the wall (or over the existing screws) and slide the device over the mount with the cable facing down. The integrated accelerometer changes the interface direction. Do you want to display your device in sight? Just open the mount, place it onto your dresser and slide the device in. Now you can display your pixel art in the living room. To surprise consumers you need to understand their needs and solve them with clever solutions. This simple cable management cord, attached to the device, makes it easy to guide all cables together and clear out the mess. The device comes in many color variations, always with a bright recognisable white 'display' and a colourful central button. This drawing illustrates how we could expand the design into a family of devices. can you do this for me too?